With wry humor, exceptional skill, unparalleled dedication and quiet diplomacy,Linda Halsey was a true leader and role model at GSAFE. Linda served as a member of our Board of Directors from 2003-2010 and continued to provide wise support and guidance outside of that role. Whether it was helping the organization make a smooth transition from being a state chapter of GLSEN to a strong independent non-profit serving all of Wisconsin, committing her time and personal resources to ensure the success of all GSAFE endeavors, or chairing the development committee, Linda was the often unseen but always present guiding force behind every facet of GSAFE’s early growth and success. Her talents were most especially apparent in the area of fundraising and board/staff relationships, but her imprint is on all things GSAFE. We miss her brilliance, calm demeanor, institutional memory, and perfect hair. Just as GSAFE held a special place in Linda’s heart, Linda continues to hold a special place in ours. Linda was commited to building a base of stable, unrestricted, and ongoing funding to support the day to day costs associated with helping LGBTQ+ youth thrive in Wisconsin K-12 schools. 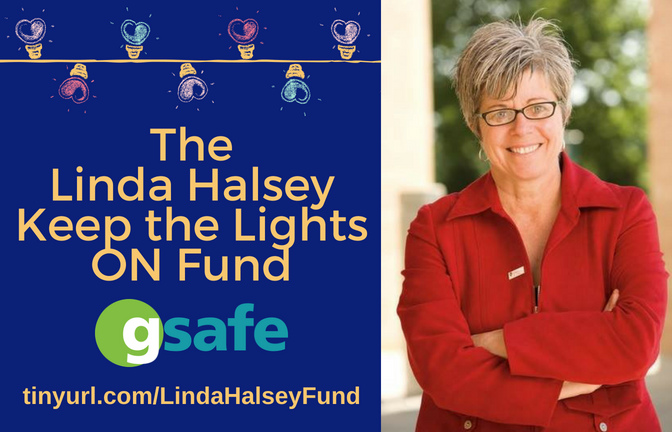 The Linda Halsey Keep the Lights ON Fund is a heartfelt and cheeky way to honor and acknowledge Linda’s contributions and talents. By becoming a Linda Halsey Keep the Lights ON Fund member with your recurring, monthly gift, you not only help keep the lights on, but you also partner with GSAFE to support the many brilliant transgender and queer youth leaders across Wisconsin whose creativity, dedication, and authenticity shines bright.